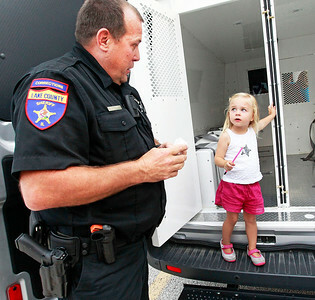 Candace H. Johnson-For Shaw Media Rich Gierlach, a Lake County Sheriff correctional officer, talks with Lyla Barry, 3, of Gurnee as she stands in a Lake County transport vehicle during Touch-A-Truck at Hunt Club Park in Gurnee. 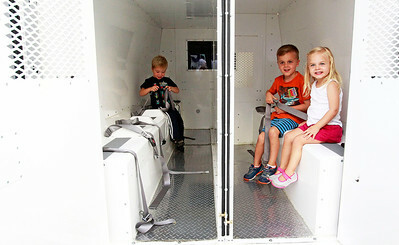 Candace H. Johnson-For Shaw Media William Hummel, 4, Larry Barry, 5, and his sister, Lyla, 3, all of Gurnee, sit in a Lake County transport vehicle during Touch-A-Truck at Hunt Club Park in Gurnee. 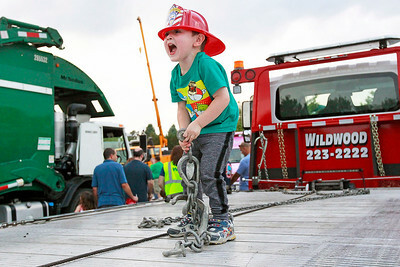 Candace H. Johnson-For Shaw Media Liam Perunko, 3, of Gurnee pulls a chain on a Wildwood flatbed tow truck during Touch-A-Truck at Hunt Club Park in Gurnee. Liam was at the event with his father, Robert. 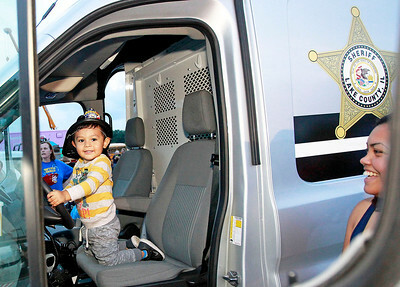 Candace H. Johnson-For Shaw Media Lionel Aguero, 2, of Waukegan sits in the front seat of a Lake County Sheriff's Office Ford transit van with his mother, Kassandra, watching over him during Touch-A-Truck at Hunt Club Park in Gurnee. 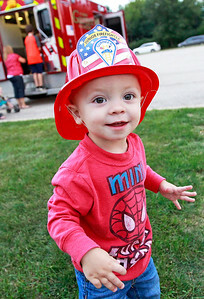 Candace H. Johnson-For Shaw Media Nolan Tate, 1, of Round Lake wears a junior firefighter's hat during Touch-A-Truck at Hunt Club Park in Gurnee. Nolan was at the event with his mother, Rebecca. 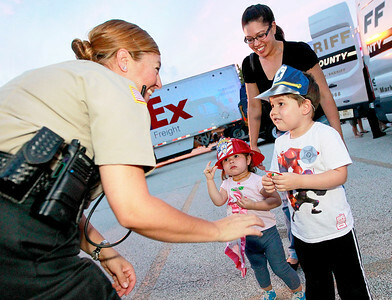 Candace H. Johnson-For Shaw Media Irma Fierros, a Vernon Hills community service police officer, talks with Xavier Shortess, 3, of Lindenhurst, his sister, Phoebe, 2, and mother, Michelle, during Touch-A-Truck at Hunt Club Park in Gurnee. 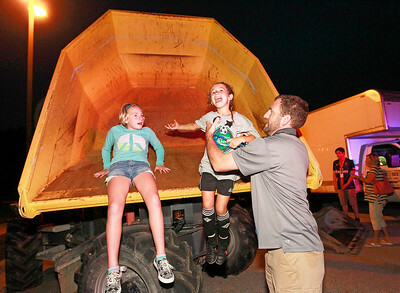 Candace H. Johnson-For Shaw Media Reese Warwick, 8, and Alia Pyrick, 7, get help getting off of a Wacker Neuson dump truck by Reese's father, Karl, during Touch-A-Truck at Hunt Club Park in Gurnee. 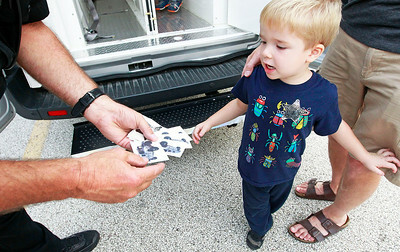 Candace H. Johnson-For Shaw Media Matthew Leverentz, 4, of Gurnee talks with Lt. Nick Kalfas with the Lake County Sheriff's adult correctional division, as he stands in an inmate transport vehicle during Touch-A-Truck at Hunt Club Park in Gurnee. Candace H. Johnson-For Shaw Media Rich Gierlach, a Lake County Sheriff correctional officer, offers William Hummel, 4, of Gurnee tattoos and stickers during Touch-A-Truck at Hunt Club Park in Gurnee. 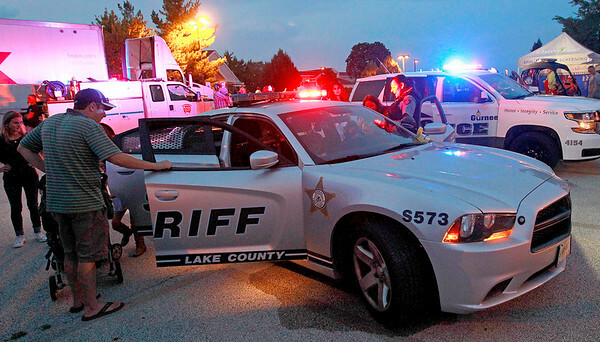 Candace H. Johnson-For Shaw Media Maria Nava, a community relations police officer with the Lake County Sheriff's Office, lets kids go in a squad car and play with the lights during Touch-A-Truck at Hunt Club Park in Gurnee. 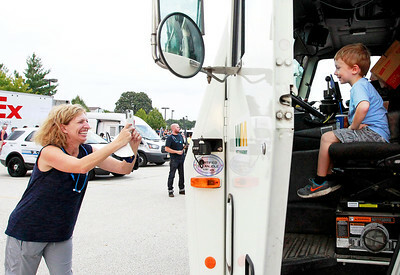 Candace H. Johnson-For Shaw Media Kristin Skoraczewski, of Gurnee takes a photo of her son, Jack, 4, in the front seat of a Waste Management garbage truck during Touch-A-Truck at Hunt Club Park in Gurnee. 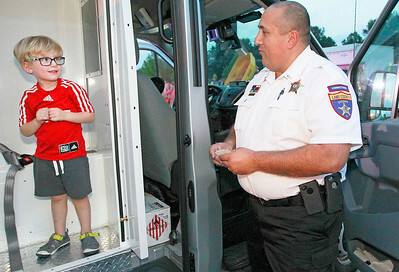 Matthew Leverentz, 4, of Gurnee talks with Lt. Nick Kalfas with the Lake County Sheriff's adult correctional division, as he stands in an inmate transport vehicle during Touch-A-Truck at Hunt Club Park in Gurnee.